#1 St. Joe Bay (12-1): The likely inside speed brings some California heat to the party, as he set a pressured pace in a pair of Santa Anita two-turn routes of late, including a fourth-place finish two back in their GIII Sham. Son of Saint Anddan goes for a Miller barn that is as sharp as they come, so if he’s freewheeling on the lead off the far turn, the rest could be in for a long day, though there’s seemingly more than enough speed to his outside to keep him honest, so a free pass on the engine doesn’t seem forthcoming. And therein lies the rub, because he’s thrown in the towel pretty readily in his last two, which means it’s tough to think he can fend off the other speed, kick clear, and hold some nice stalker/closers at bay through the long stretch; know him early, unsure about late. #2 Tiznow R J (5-1): Rousing local MSW winner two back didn’t run poorly at all when third to a few of these in the local prep, the GIII Lecomte, in his last and has every right to improve off that run, which was his first against winners. Son of two-turn specialist Tiznow is also eligible to improve with distance and maturity, and he showed last time that he doesn’t need the lead to be effective, which is a nice feather in his cap as well. Asmussen has shown time and again that he knows what to do with a nice 3-year-old, especially in Cajun Country, and you can envision this colt sitting a beautiful trip just off the early speed and getting first run off the far turn, which would put him in a mighty enviable spot over a track he obviously likes; expecting a huge run. #3 Bluff (12-1): Rousing local MSW winner is slowly progressing into a pedigree that screams two turns and maturity, as he’s by Tapit out of an El Prado (IRE) mare, which also means he’s bred to be one heck of a nice runner before it’s all said and done. And anyone who saw that romp last time knows that he’s certainly on the come in here and figures to only move forward again for Jones, who rarely runs them where they can’t compete. But with the good comes the bad, as he does pick a mighty tough spot to meet winners for the first time, and there’s no doubt that he’s going to have to run a heck of a lot faster than his last to threaten, much less beat a group like this. On the face of it, this is simply too much too soon, but this is a name you might want to jot down for use in the future; tabbing for down the road. #4 J S Bach (5-1) (2/20 update: SCRATCHED): Pletcher speedball was going to take some beating from the rail in Oaklawn Park’s much easier GIII Southwest last Monday but was rerouted here after that race was postponed due to weather, and he’s likely going to make life difficult on the rail runner, since he figures to be pressing him from the outside every step of the way. Florida-bred son of Tale of the Cat blasted state-bred maidens when sent two turns in his second career start last time at Gulfstream Park, but these are salty open foes with designs on the Kentucky Derby, so this is a seismic class rise today, regardless of who is calling the shots. The post really helps him here, as he can gauge the proceedings from his inside and try and get first run on the stalker/closers off the far turn, but we all know how long this stretch is and at this point, this might just be too much, too soon; taking a stand against. #5 Imperia (7-2): Tepid ML favorite joins stablemate Frosted in Florida to give Godolphin their two best Derby hopes in years and rates close scrutiny as he makes his much-anticipated seasonal debut for McLaughlin. 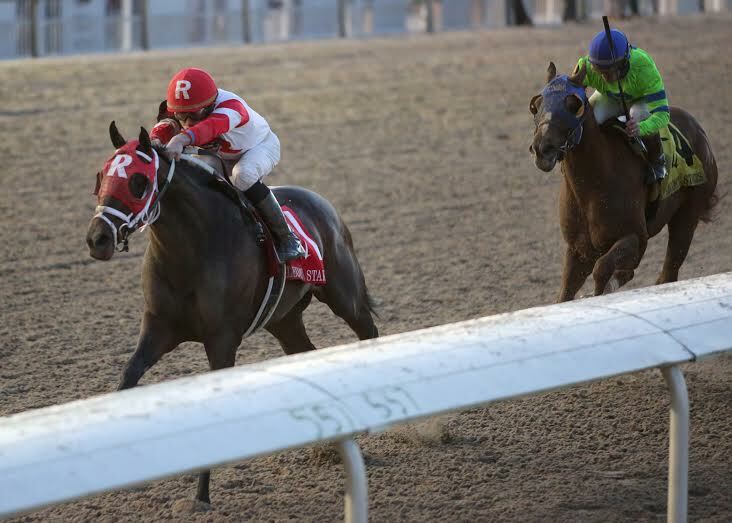 Homebred son of Medaglia d’Oro was a fine second, beaten a head to subsequent GIII Jerome winner El Kabeir, in his dirt debut in Churchill Downs’ GII Kentucky Jockey Club when last seen in November and enters off a steady string of drills at Palm Meadows. Closer exudes class and it’s no surprise to see him land here, as the long stretch seems tailor-made for his style, and there’s enough speed to set him up, too, so even though this is just a jumping-off point for what his connections hope leads to a blanket of roses on the first Saturday in May, the thinking is that his best is simply too much for this group; returns with a bang. #6 War Story (5-1): Lightly raced but talented runner was rerouted to this spot after drawing wide in Oaklawn Park’s GIII Southwest last Monday and warrants a long look, as he was a sharp second in the Lecomte. Son of Northern Afleet goes for an Amoss barn that just keeps clicking along at over 30%, and this gelding brings a nice blend of tactical speed and stamina to the table, which ensures him a perfect trip just off the early speed. And sure, he was handily beaten by today’s rival International Star last time, but he also endured a wide trip and was making just his third lifetime start, compared to seven for that guy, so there’s a ton of upside in this corner, which means you better take notice; looms a major player. #7 Hero of Humor (30-1): Decided longshot from Dorochenko enters off a slow local two-turn optional claiming win last time after pressing the pace early then holding on late, which came just nine days after running sixth in the Lecomte, so it’s pretty obvious that he’s looking up at these. Sharp Humor colt, if nothing else, has improved since going two turns over the track and should sit an up-close, stalking trip, but that’s where any positives end. On paper he’s the longest of the long in here and expect that to prove true when the gates open as well; easy toss. #8 Keen Ice (8-1): Deep closer had no chance over the paved highway that is Gulfstream Park when a distant fifth in an extremely fast renewal of their GII Holy Bull to kick off his season last month and no doubt would be the one to benefit the most if the pace gets too hot up front. Son of Curlin also had no chance in his seasonal finale, when he was a well-beaten third in Aqueduct’s GII Remsen, as it was run over one of the most intensely speed-favoring tracks in New York all year. Romans charge has some talent and deserves respect, especially since he just ran against Upstart and Frosted, who are on most people’s short list of Derby contenders right now, but when you have no speed, are at the mercy of the pace, and will be spotting some nice runners several lengths off the far turn, it’s not exactly a recipe for success; limiting his use to underneath, if at all. #9 Big Big Easy (12-1): The second from Asmussen figures a heck of a lot longer than his 12-1 price as he makes his seasonal debut off a distant fifth-place finish in Delta Downs’ Jean Lafitte in October, so yeah, this is an odd spot to kick off a campaign to be sure. It’s tough to draw a line through that run, but if you do, then you do see a solid one-turn optional claiming win at CD in September, when he stalked the pace early and drew off late over Eagle, who was actually favored in the Lecomte. Midshipman runner figures to be part of the vanguard early, but with this wide draw, off a disappointing run that came almost four months ago, it’s mighty tough to think he can play with a group like this; for Mardi Gras fans only. #10 International Star (9-2): Upset winner of the Lecomte will look to validate that run, but anyone who saw the win might have thought he was 4-5 that day and not 9-1, as he blew the race apart in the stretch in his local debut. The surprising thing was that that was also his first win on dirt, as he was thought to be more of a turf/synthetic runner for Maker, breaking his maiden sprinting on the turf and then winning Woodbine’s GIII Grey over the Polytrack in December. Fans will say he was hardly disgraced when fourth in the Kentucky Jockey Club behind Imperia, and just maybe he’s the typical sophomore who has grown up and is flourishing at the right time. Son of Fusaichi Pegasus is out of a French Deputy mare, so he sure is bred for the real stuff, but there’s also little doubt that he’s meeting a tougher crew than the one he just thrashed, not to mention ‘R J and War Story are eligible to build off their stakes debuts. Point being, if you didn’t go to the wedding at 9-1, do you really want to take a third of that price from a wide draw when seemingly everyone but him has a license to run better this time around? Making him prove it.